There are currently two types of DC-Excited, sealed co2 laser tubes available in the market . Descriptions and photos on this page. Type 1- Not Made in USA laser tubes which have the metal ends Glued to the glass tube (not manufactured, serviced or sold at Parallax). 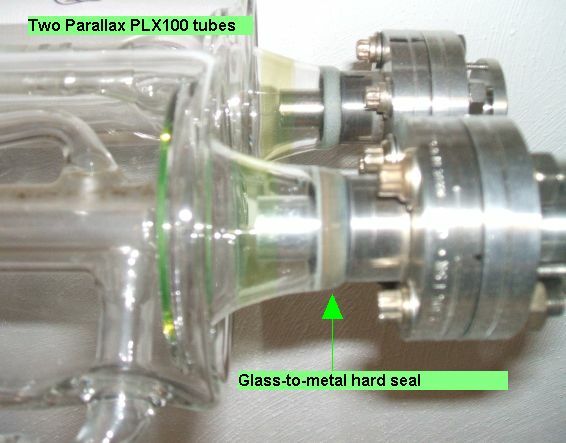 Type 2- U.S. made Parallax Technology laser tubes which have Hard-Seal, Glass-to-Metal connections at both ends. Glass-to-metal seal is one in which glass is melted onto a hot metal surface and the seal is retained when the joint is cooled to room temperature and can be re heated / cooled without any problem. Metal and glass have different coefficient of thermal expansion. If heated, metal will expand more than glass and the joint will crack. Therefore, not all metals can be hard-sealed (melted) onto all glass. 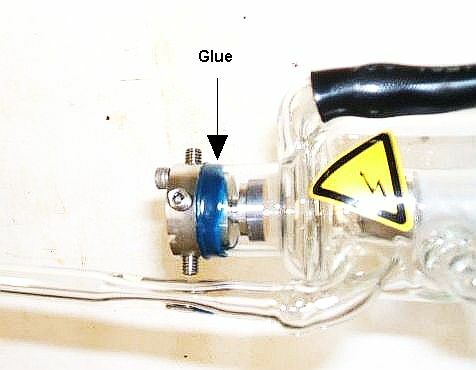 Glass-to-metal hard-seal technology was needed during the World War II for long life, temperature stable vacuum tubes used in radar applications. For this purpose a special alloy was developed at Stupakoff (a Carborandum Company) to have the same coefficient of thermal expansion as a type of glass manufactured by Corning Glass. At the ends of co2 laser tubes are usually a Glass-Metal transition and during laser operation this transition rises in temperature. Only expert glass blowers, such as our own, can do the Glass-to-Metal graded seal which is characteristic of our laser tubes. The glass-to-metal seal is stable at elevated temperatures up to 300 degrees C and is leak tight beyond any measurable amount. Type 1- Metal and glass are joined with Glue. No explanation is necessary but you can see more examples at THIS PAGE and find out what questions to ask the e-bay entrepreneurs who advertise cheap laser tubes. It is OK to buy cheap stuff but EDUCATE YOURSELF because the seller is Not going to tell you the weak points. 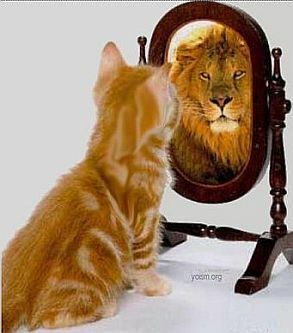 Always, always always remember, DO NOT ASSUME ANYTHING. The following photographs demonstrate the issue. 1. 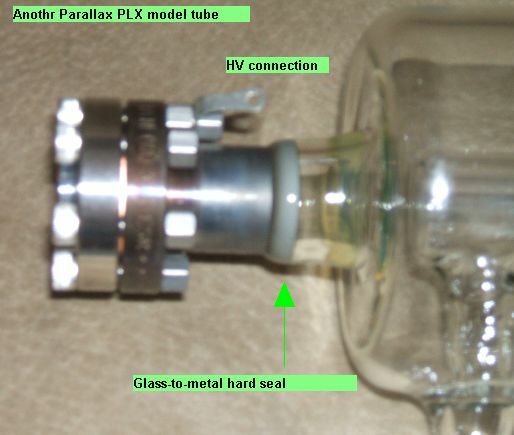 Example of a Parallax PLX model laser tube with Glass-to-Metal Hard Seal. 2. 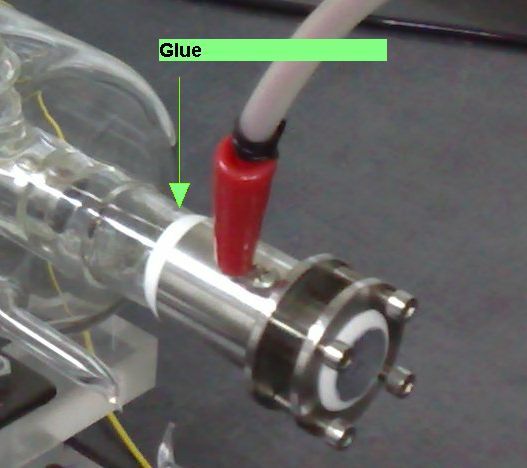 Example of a co2 laser tube with Glued ends. 3. 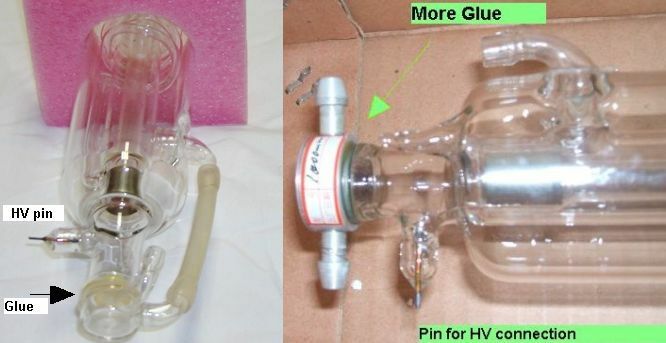 Examples of made in China co2 laser tubes with Glued ends. 4. Another third party co2 laser tube with Glued ends. 5. 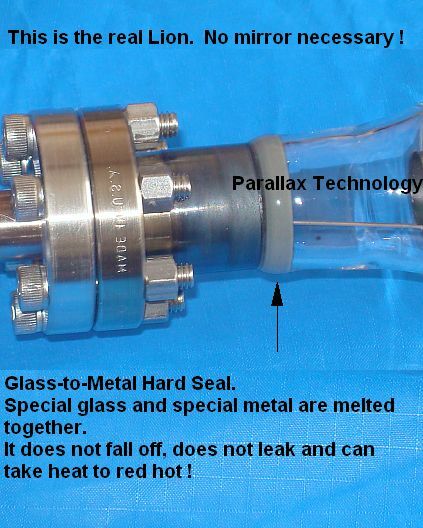 And again, a Parallax laser tube with glass-to-metal hard seal. of the many factors that determine "the life" of a sealed co2 laser tube, its construction and cleanliness are of paramont importance. 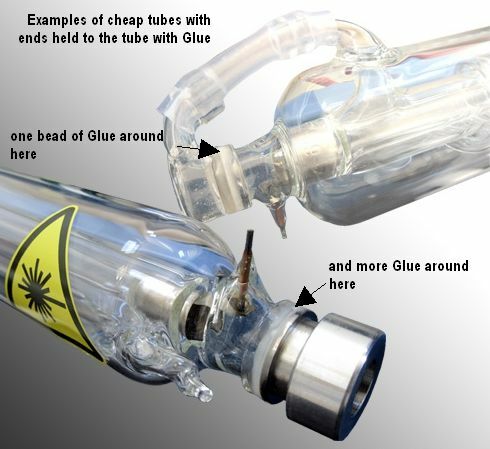 CO2 laser tubes with glued ends are much cheaper than Hard Sealed tubes. If you need a co2 laser for a short time to run it and check on a project feasibilty then by all means, buy the cheapest laser tube you can afford until you are sure. 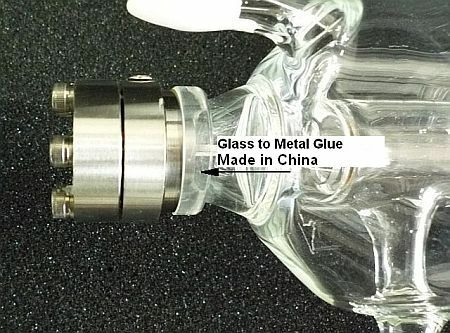 If you are a hobbyist that occasionally uses a co2 laser, be careful, the cheap laser tube may not turn ON after 6 months when you come back to it because the Helium inside may have leaked out or the glue vapor has suppressed the laser power. and Most Importantly, destroys your reputation. an Industrial tube that fails due to its short life-time will shut down the factory line and may cause thousands of dollors in loss AND you will lose that client for ever. Famous Chinese proverb says "you always get what you pay for".